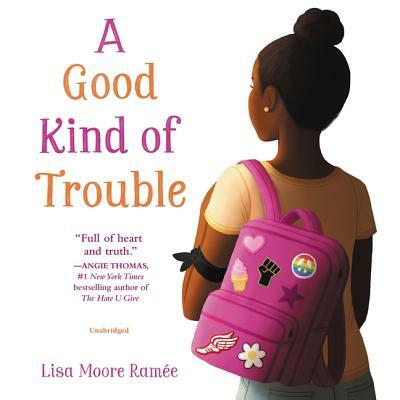 From debut author Lisa Moore Ram e comes this funny and big-hearted debut middle grade novel about friendship, family, and standing up for what's right, perfect for fans of Angie Thomas's The Hate U Give and the novels of Ren e Watson and Jason Reynolds. But in junior high, it's like all the rules have changed. Now she's suddenly questioning who her best friends are and some people at school are saying she's not black enough. Wait, what? Shay's sister, Hana, is involved in Black Lives Matter, but Shay doesn't think that's for her. After experiencing a powerful protest, though, Shay decides some rules are worth breaking. She starts wearing an armband to school in support of the Black Lives movement. Soon everyone is taking sides. And she is given an ultimatum. Shay is scared to do the wrong thing (and even more scared to do the right thing), but if she doesn't face her fear, she'll be forever tripping over the next hurdle. Now that's trouble, for real.